Prominent & Leading Manufacturer from New Delhi, we offer bio medical waste bin with frame, bio medical waste bins with trolley, biomedical waste 4 bin trolley and plastic waste bin with foot pedal. 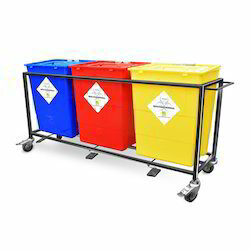 Being a well known organization, we are also engaged in offering a wide range of Color Coded Bins with Trolley to meet the demands of our clients. These products are available in different range of alluring colours and are offered in different sizes and dimensions. All these products are well equipped and ensure long lasting service. Stainless Steel frame and trolley on castors with foot operating system and one Autoclavable and Environment friendly, reusable plastic bins as per Bio Medical Waste colour coding. We offer a wide range of high quality of HDPE Bins to our customers. These containers find wide range of applications in Hospital industries. Our containers are widely appreciated by our clients for their unique features such as they are lightweight, durable, chemical-resistant and non reactive in nature. One, Two, Three and Four Compartment waste segregation system. the bins comply UN & NFX standards of safety. Available Bin Size 30 Ltrs. & 60 Ltrs. Colors Available Red,Blue,Yellow,Green & Black.